A well decorated bowl with an elegant diapered border and basket of flowers. Some retouching to gilding. 11-1/4 inches in diameter.  12-1/4″ Famille Rose Charger from service similar to John Quincy Adams(page 107 Schiffer s China for America).